A delicious Italian dish of tender pasta and classic flavours. There is no pasta that can compare to fresh homemade pasta, with it's silky texture and delicate bite. In this dish it is complemented with a creamy and mild four cheese filling and a slow cooked Italian tomato sauce. I have always enjoyed experimenting with flavours from around the world, and would like to share some of my favourites with you. One of my all time favourites has to be pasta though, in its many varieties. I must cook at least one pasta dish for my family every week. 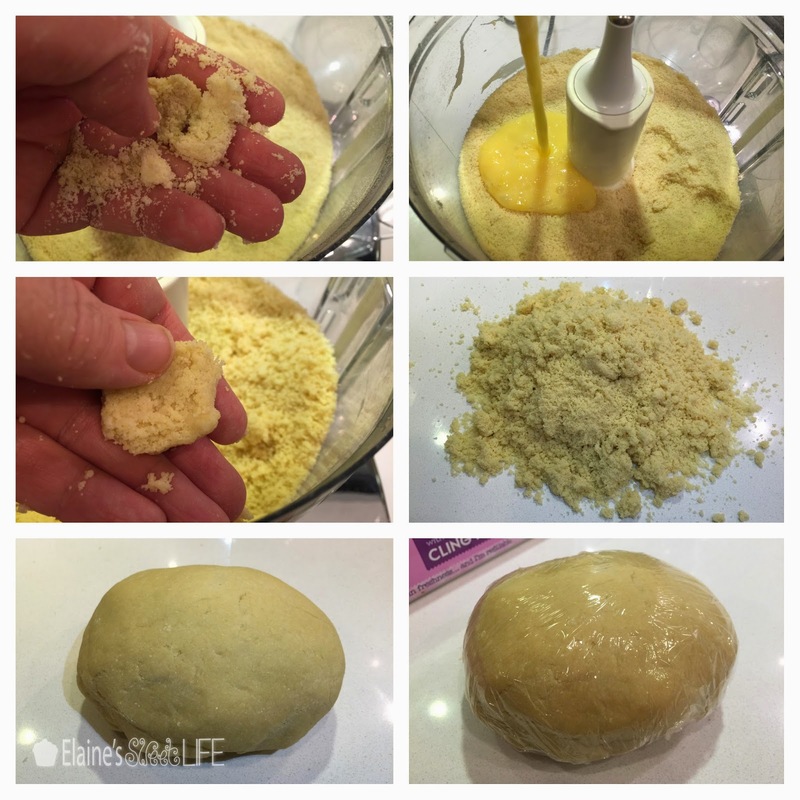 Start by making the pasta dough. This should be made the night before, or at least a few hours before needed. 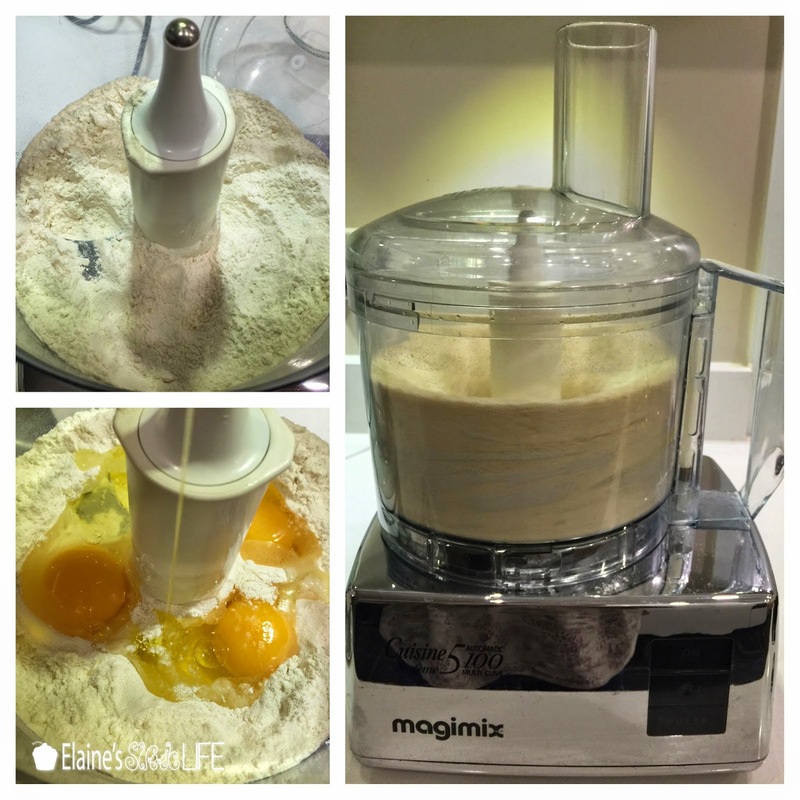 Put the flour into a blender, add 3 of the eggs (try and keep them away from the sides of the bowl) and oil. Blend until crumbs form. Pick up some of the crumbs and press them together gently between your fingers to form a lump of dough. If the dough sticks together and does not crumble easily, you're there. If the lump can be crumbled apart, more egg needs to be added. Beat the remaining egg, then pour a little bit of it into the crumbs. Blend, then check the consistency again. Keep adding egg little by little until the consistency is right. 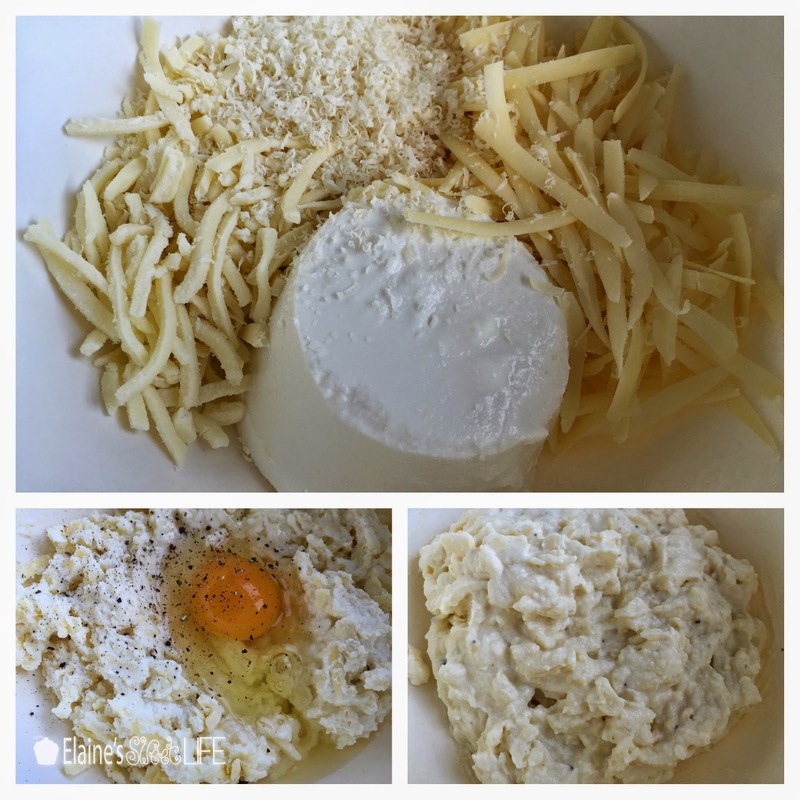 If the crumbs start clumping together in the blender, too much egg has been added. A little bit of flour can be added to take it back to crumbs again. The dough can also be made by hand. Just add all 4 eggs and the oil to the flour, mix together until it is all combined, then knead until it forms a stiff (but still slightly lumpy) dough. 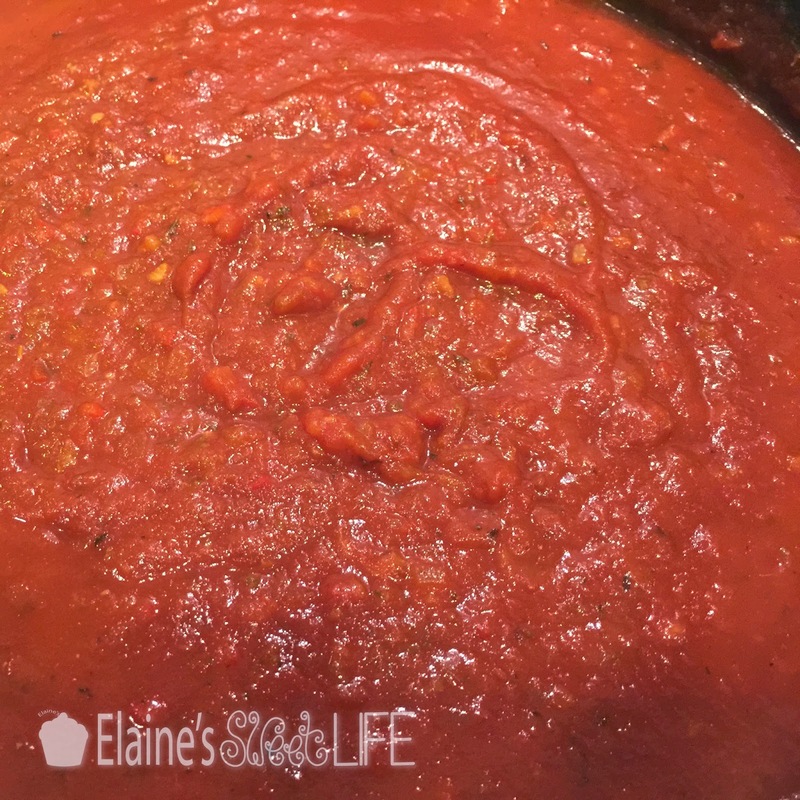 The Tomato Sauce should be started at least 4 hours before serving. 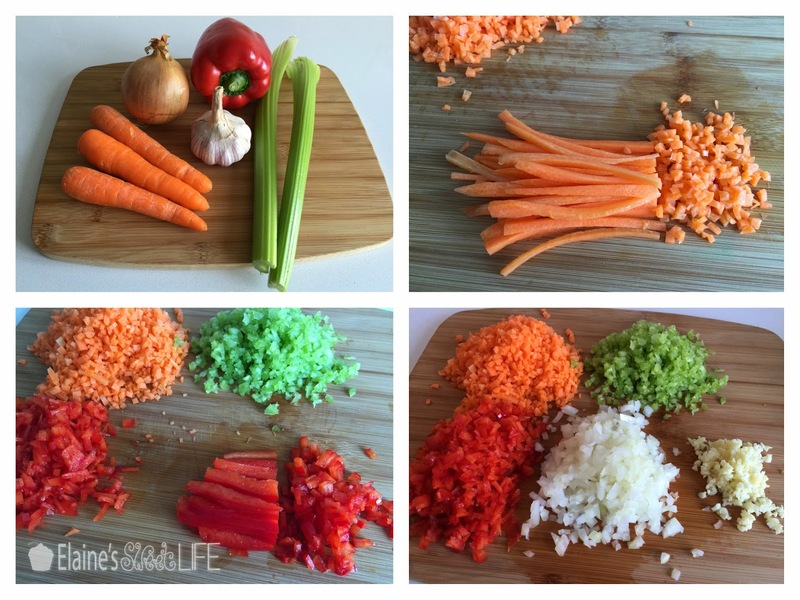 Chop the garlic, onion, carrots, celery and red pepper into a fine dice. Pour the olive oil into a hot saucepan, then fry all the diced veg until golden in colour, stirring regularly. Pour in the vinegar, stir round and simmer for a minute. 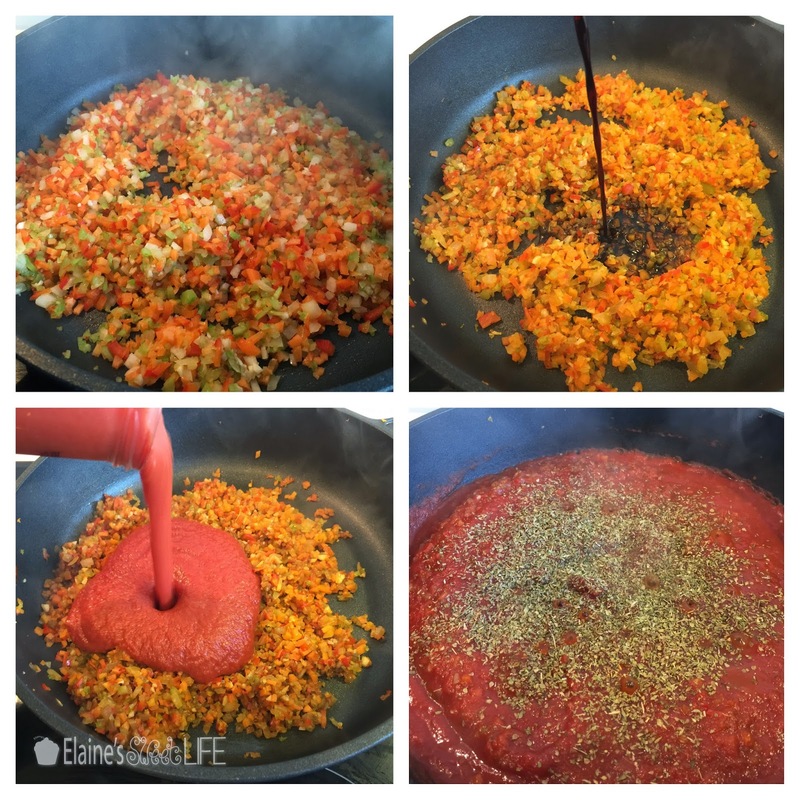 Pour in the sieved tomatoes and stir through. Add sugar, salt & pepper (to taste) and a generous sprinkling of oregano. Stir though and bring up to simmer. Reduce heat, cover and simmer, stirring occasionally, for 3-4 hours. 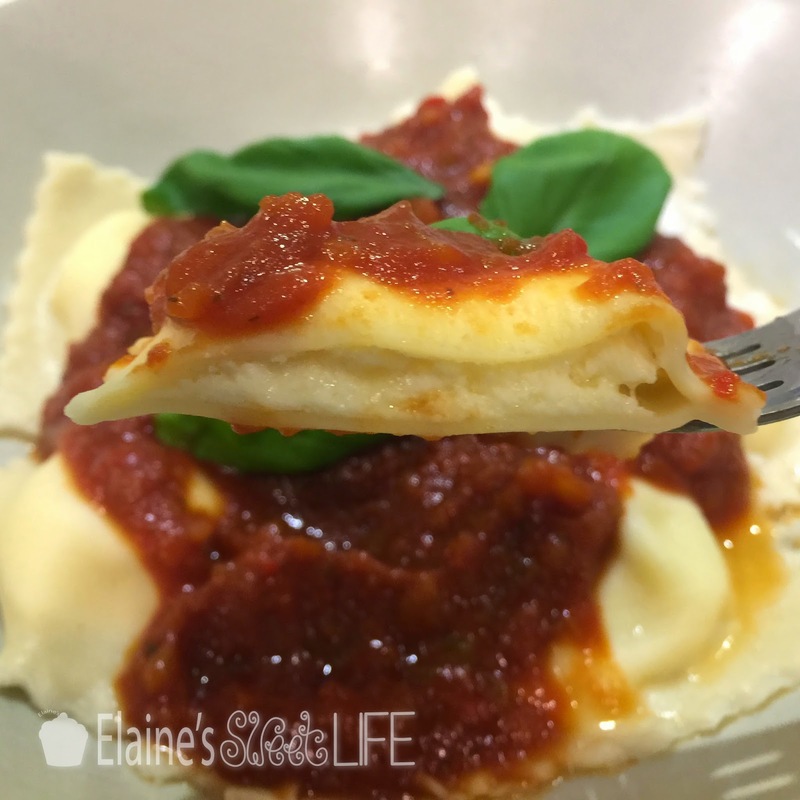 While the sauce is simmering, make the Ravioli. For the filling, mix the cheeses, egg, salt & pepper (to taste) together and set aside. The pasta dough has rested and should feel softer. Split the dough into 4 pieces. With your pasta roller on the widest setting, roll a piece of the dough through, then fold and roll through again. Keep doing this until the dough becomes smooth (about 10 times). Once it is smooth roll the dough out nice and thin - I took mine to setting 7 on my roller. Dust with a bit of flour to stop it from sticking to the counter (or other sheets of pasta) and cover with cling film to stop it drying out. Do the same for the other 3 pieces of dough. Pasta can be rolled out by hand - a pasta roller is not required. Lay a sheet of pasta over the mould. Press the pasta gently down into the recesses in the mould (be careful not to tear it.) Spoon a little bit of the cheese filling into each recess (about 1/2 tsp). DON'T overfill! Brush around all the edges and between recesses with water. Lay a second sheet of pasta on top, pressing it down gently with one hand as you lower it down, being sure to press out any air from the pockets (air pockets can cause the ravioli to burst when cooking). Roll over the top with a little rolling pin, sealing the two layers of pasta together. Some moulds will actually cut through the pasta at the same time, separating the individual ravioli as you roll over it, but mine only seals. 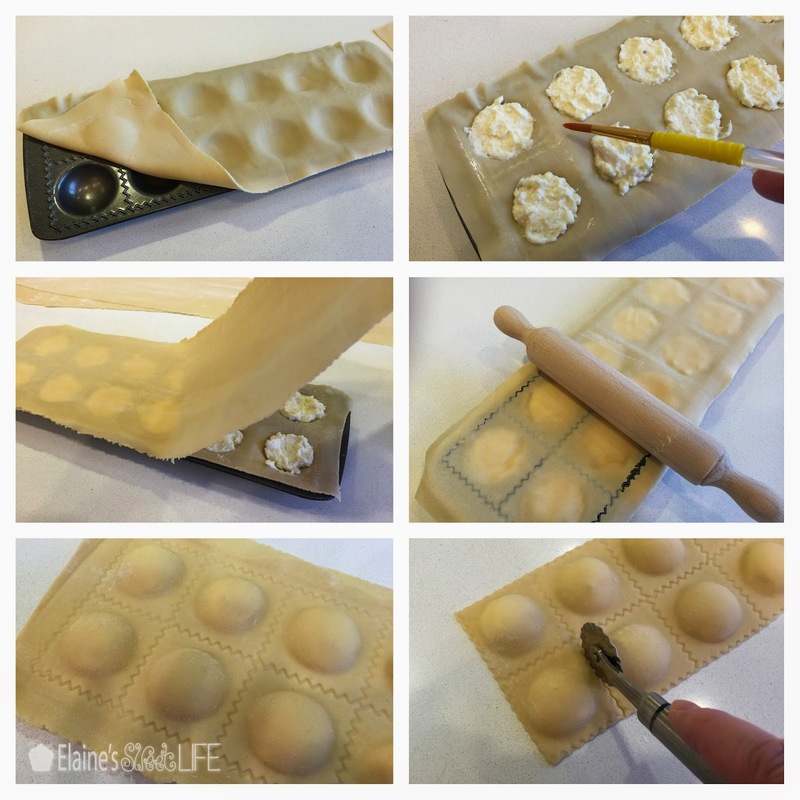 Tip the pasta out of the mould and cut the ravioli apart with a pastry cutter. Dust with flour and set aside until ready to cook. 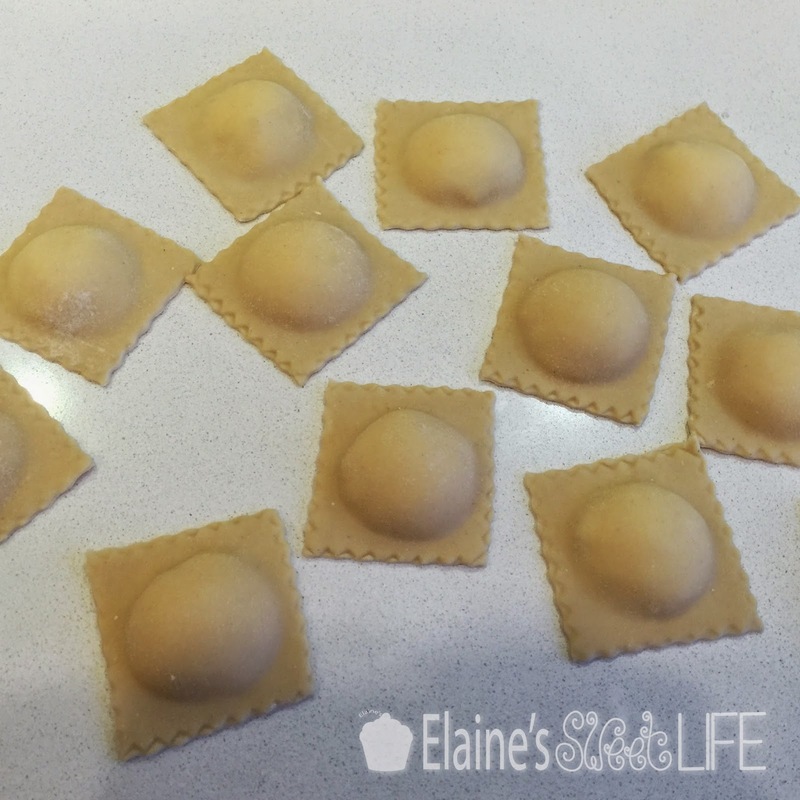 Without a ravioli mould: Lay a sheet of pasta on the counter. Spoon little mounds of filling along the length of the pasta. Since you aren't using a mould, you can make them as big or small as you like. Just ensure there is enough pasta around each mound of filling to seal the ravioli closed. Brush water onto all of the exposed pasta, around the filling. 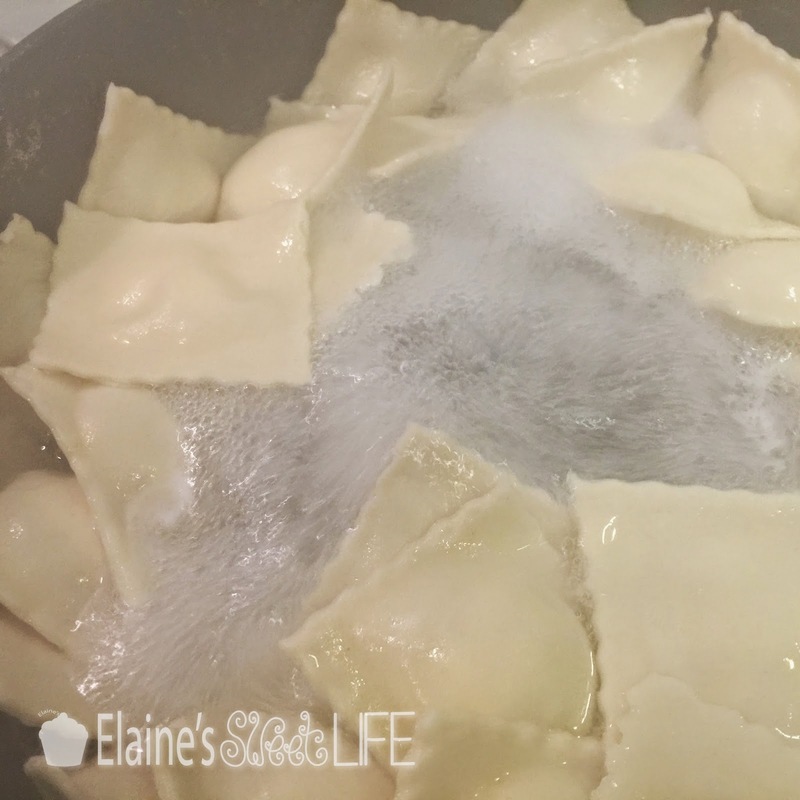 Lay a second sheet of pasta over and smooth it down over the mounds of filling, stretching it slightly and pressing out all pockets of air (air pockets can cause the ravioli to burst when cooking). Press down on the pasta between the pockets of filling to seal the two layers of pasta together. 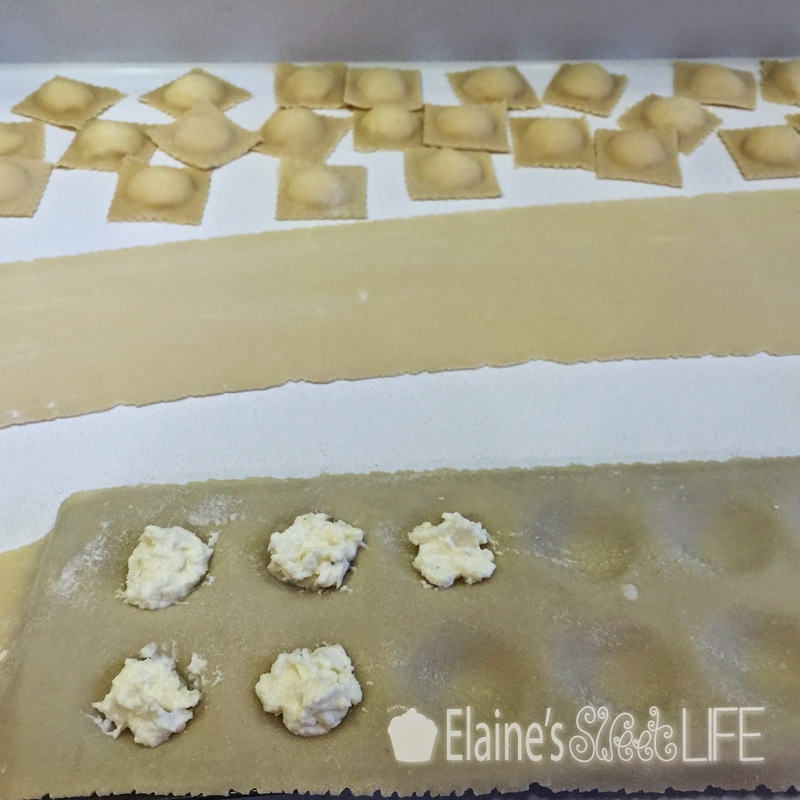 Cut the individual ravioli apart with a pastry cutter. 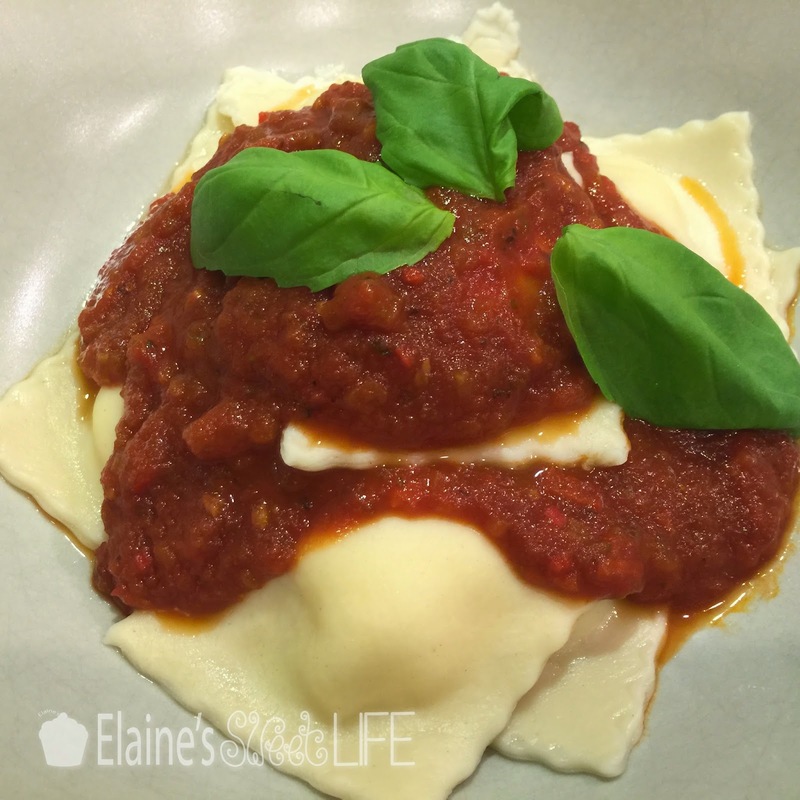 The ravioli should immediately after cooking. Bring a large pot of water to a rolling boil. Add enough salt to make the water taste salty (like sea water). Add ravioli one by one to the water (to prevent sticking). Cook in batches, if too many are cooked together, they will stick to one another. Boil for 6-8 minutes, stirring occasionally to make sure they cook on both sides (they float, so the top side doesn't cook as quickly as the bottom). Be very gentle when stirring so as not to break the ravioli. Ideally it would be best to boil the ravioli with only enough in the pot to cover the surface of the water in a single layer - in that case you would only need to turn them over half-way through the cooking time. Make sure the water is boiling constantly. Remove ravioli from the water with a slotted spoon, allow water to drip off, place in serving dish and smother with the tomato sauce. Add a generous helping of fresh basil leaves. Thanks boui-boui. I know exactly what you mean. 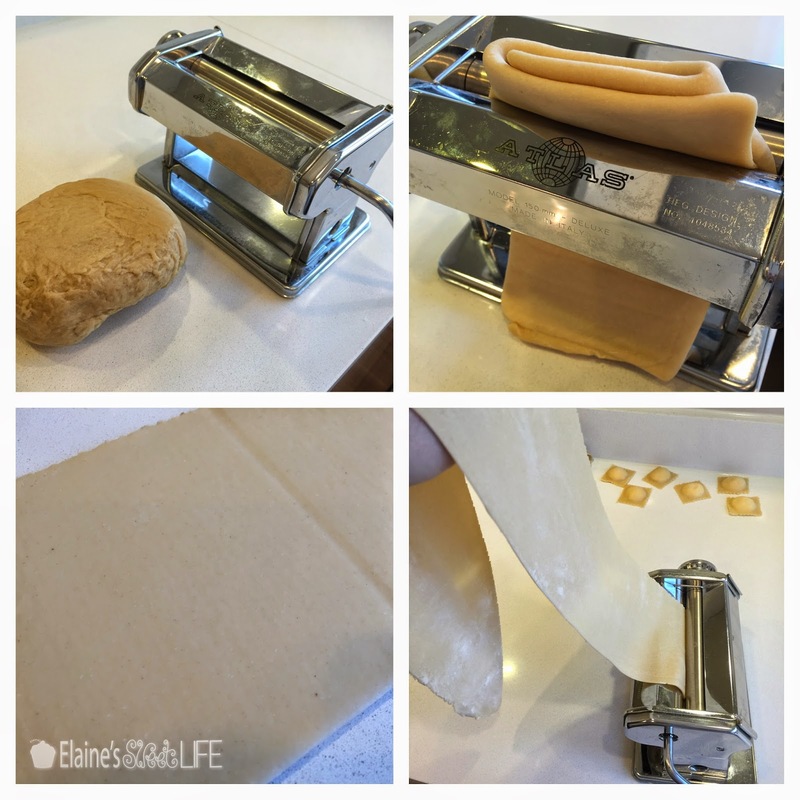 When I first started making my own pasta (my hubby bought me a pasta roller for our second Christmas in 1996 - his colleagues thought that was the end of his marriage LOL) I had a really hard time finding much information beyond just mixing up the basic ingredients, kneading the dough and rolling it out.